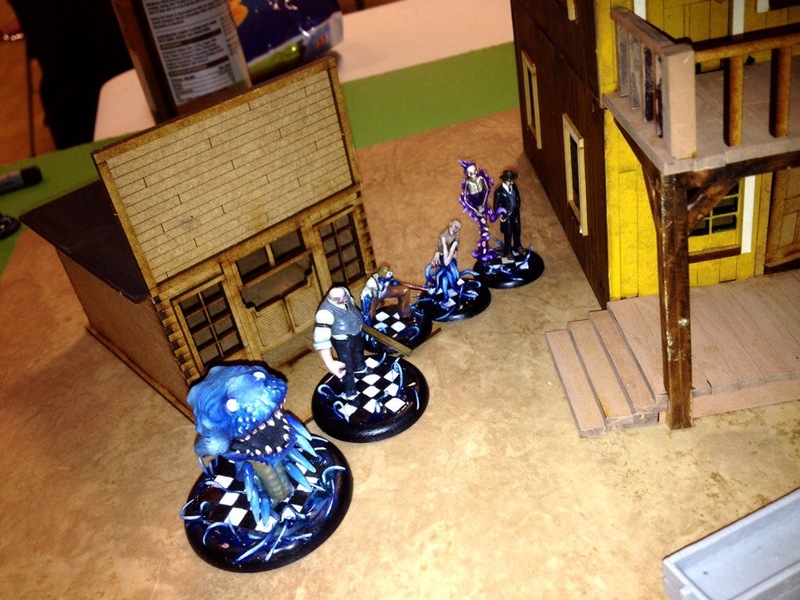 Malifaux – Jakob vs. Seamus – The rematch! 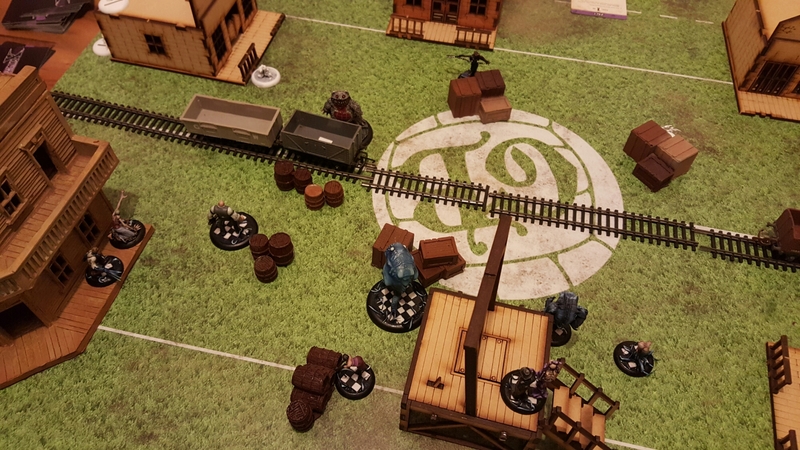 A very good game of Malifaux this evening. I went for Prisoner (Seamus) and Framed for Murder (Depleted) as my schemes. 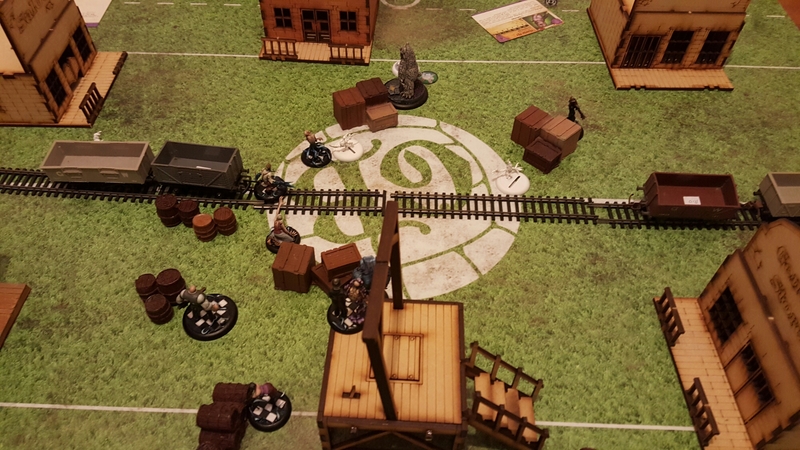 The strategy was Turf War so my game plan was simple : rush the middle of the table, get the Depleted killed and try and tie up Seamus with my big guys. The game started off fine, if a little cagey. I walked everyone toward the centre and watched as Seamus snuck down a flank. My opponent starting dropping markers and a look down the board’s diagonal suggested he was playing Line in the Sand. After a couple of turns Huggy was battling with a Flesh Construct and this, I feel, was the pivotal point of the game. I made two key errors here : Firstly I forget Huggy’s upgrade which would have given him an extra attack ; secondly I allowed my hand to empty which gave the Flesh Construct Reactivation. The Fleshy dude duly pummelled Huggy and this put Jakob in trouble. 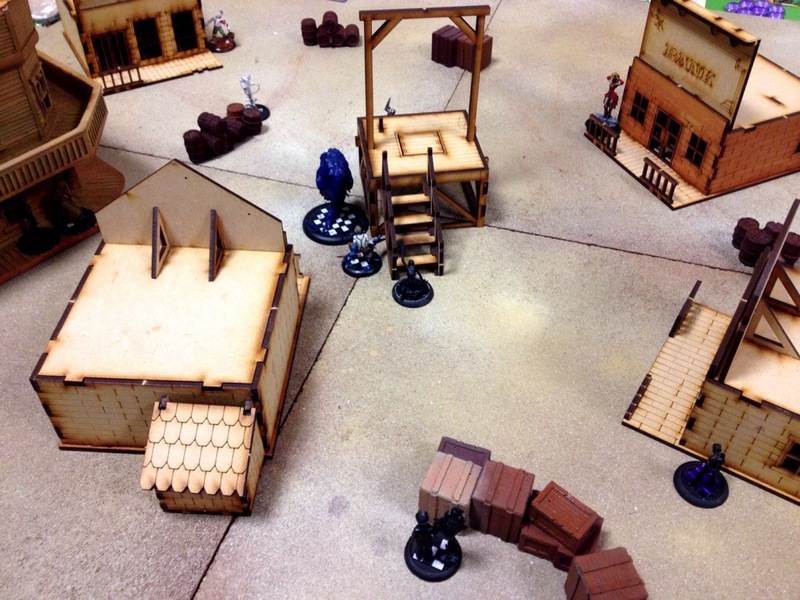 The one saving grace was that Seamus made his move toward the centre and I was able to use a Beckoner to drag him into Mr Grave’s charge range. 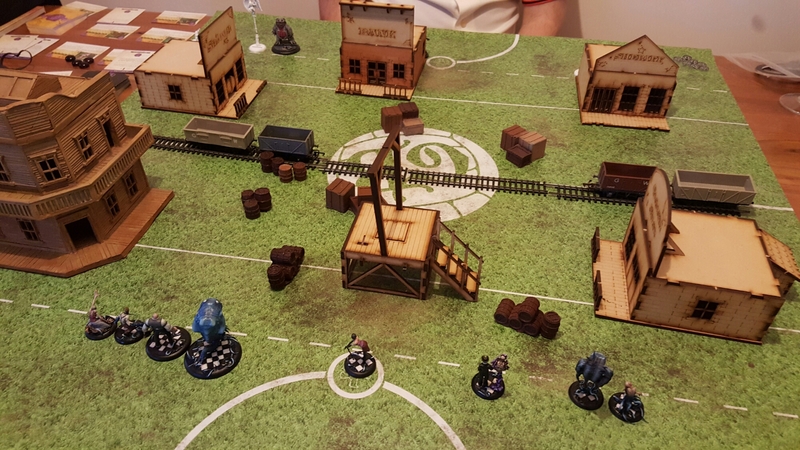 When turn 5 came around Jakob and Mr Graves took Seamus prisoner, the Flesh Construct had murdered the Depleted and I had totted up a few VPs in the Turf War. Although Jakob’s crew was severely beaten I thought my 6VPs might be enough to put me in with a chance. As it turned out Seamus bagged 6 as well : A draw! 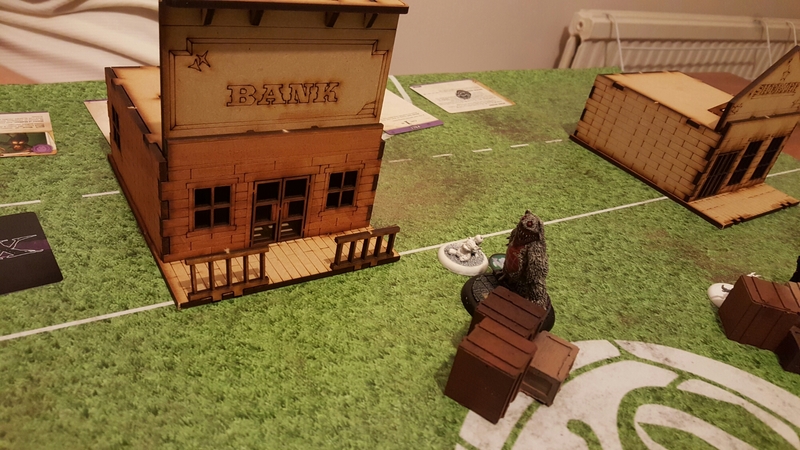 I enjoyed the game although the few weeks since my last were enough for me to forget most of the rules! A big thanks to Kev for his patience guiding me through (again! ) and providing the rather nice scenery . 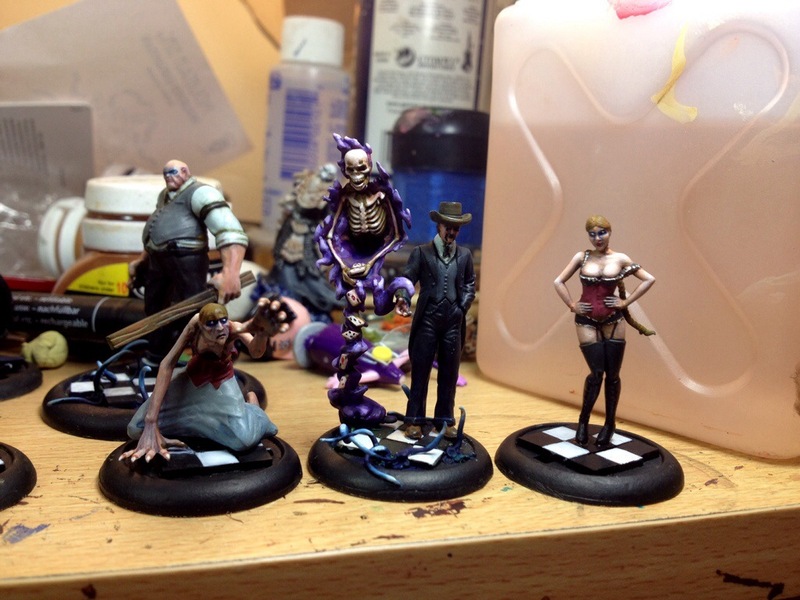 Over the last few days I’ve finished up the Beckoner and the first Depleted. 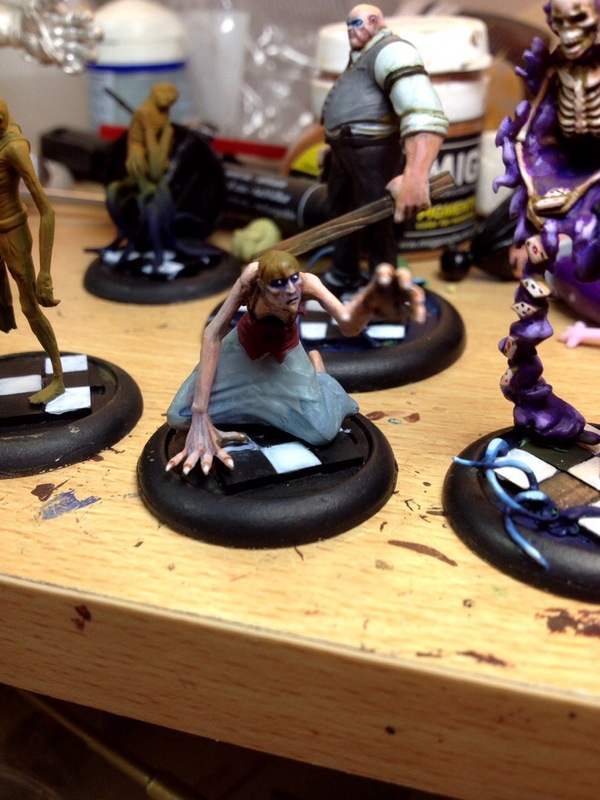 I also managed to paint a second Depleted. This model is actually a nice sculpt although the tentacles are a bit crazy. It took no time at all which is great news. 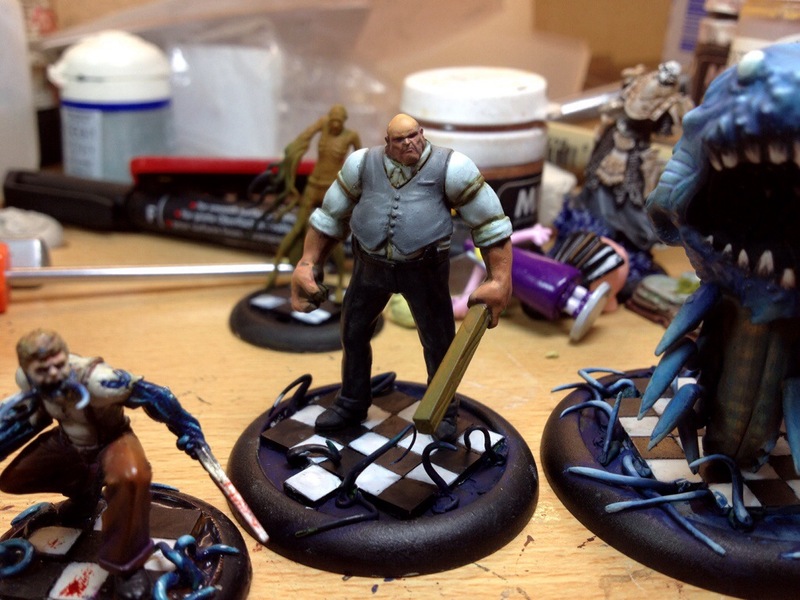 Next up is Mr Tannen and a second Beckoner. That will leave a final Illuminated and Depleted model to finish but I think I may leave those for another day as I will have a 50 soul stones crew done. Jacob is pretty much done in this shot. I went for a purple smoke effect with his skeleton butler. The cards were a bit of a challenge and in the end I used a very fine pen to mark them rather than a brush. The Beckoner is a lovely sculpt – one of the best in this crew I feel. She didn’t take long and is nearly done in the shot below. The Depleted is a fine attempt at sculpting a broken old woman. I like the concept but it doesn’t quite hit the mark. Nonetheless I think it is the pick of the three Depleted sculpts so will make it into the crew. She still has a fair amount of work to be done but is getting there. 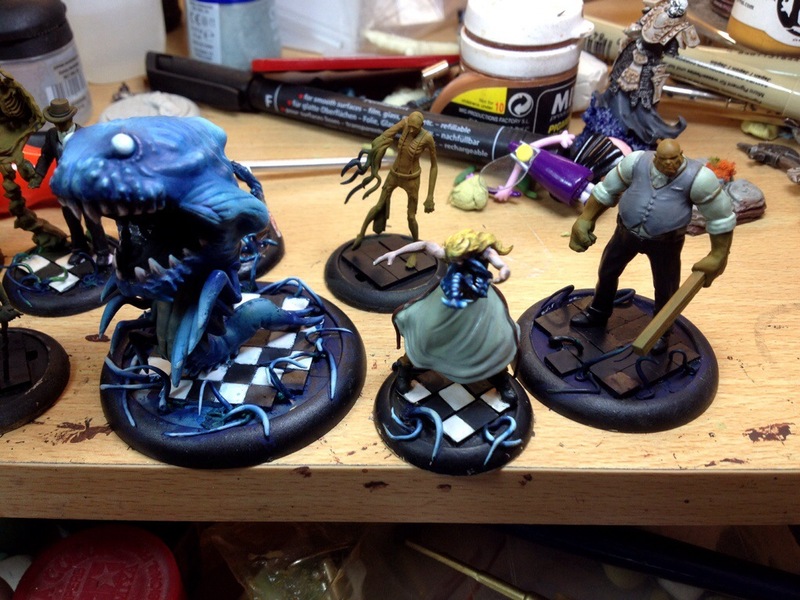 The crew is taking shape now and I’m pretty happy with the result. 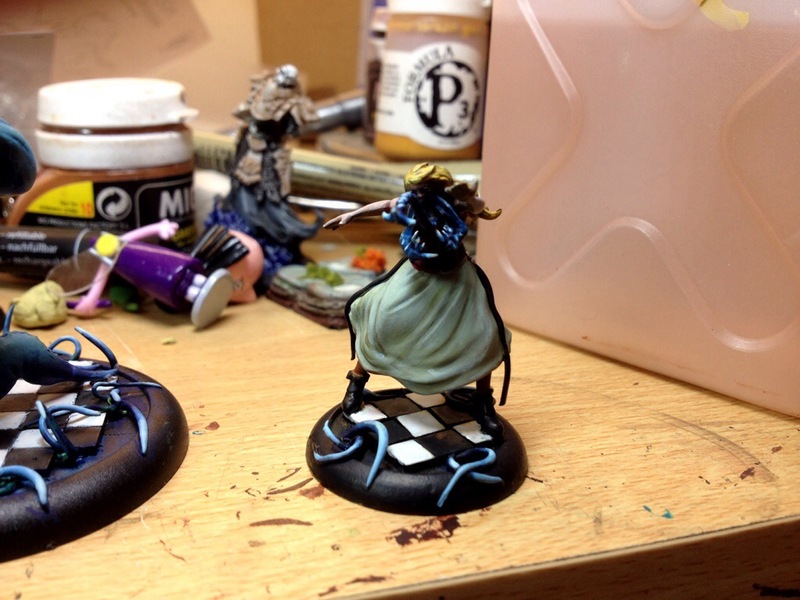 The plastic sculpts are interesting to paint. The quality is variable on each model and between models but overall I think it’s very respectable. And more on Jacob and co. I finished the second Illuminated this evening and Huggy is as good as he is going to get. I also made some good progress on Mr Graves. I’m loving this model more and more. 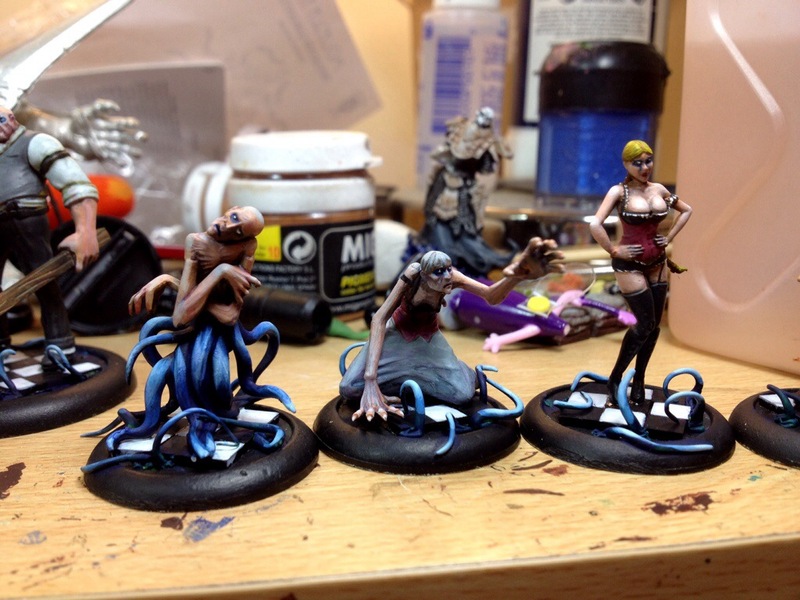 Another game of Malifaux lined up for the weekend so I’ve been chipping away at my Jacob crew. Huggy is proving to be a real problem. The sculpt is lacking in detail but at the same time is not flat. 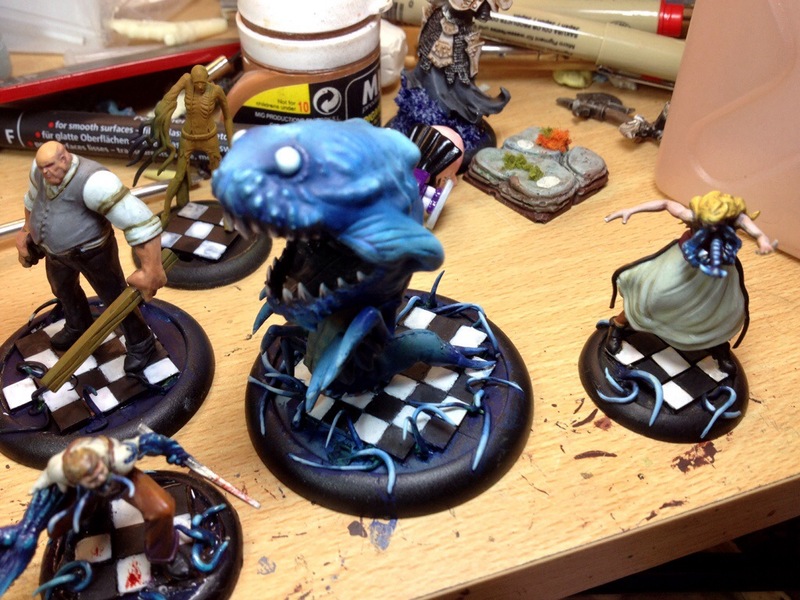 It truly is a bizarre model and a painters nightmare. I’ve tried all sorts to get him to look right and I’m still not 100% happy with the result. In the end I airbrushed him developing highlighted regions and then went back and added more contrast with a brush. 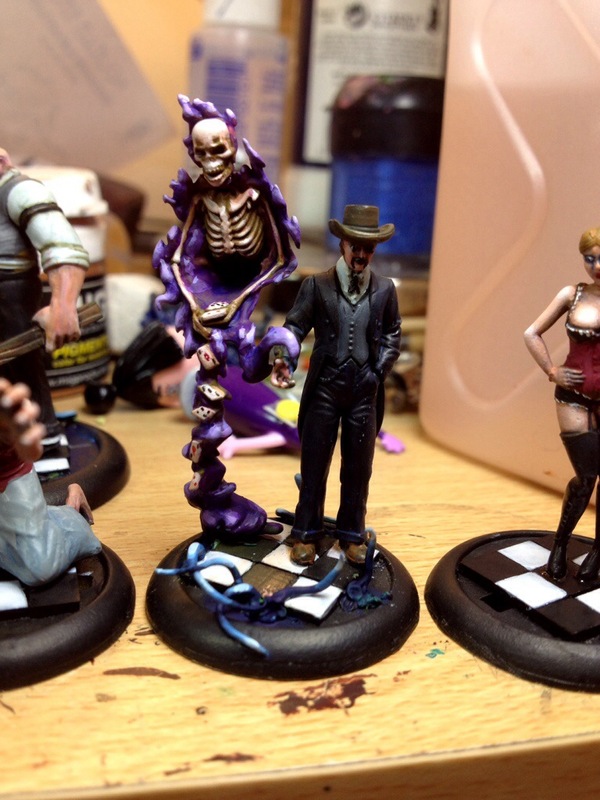 I’ve also made reasonable progress on a second illuminated and Mr Graves. Mr Graves is a fantastic model. The sculptor has really captured the gangster hard-man vibe. I ‘m looking forward to finishing him up. 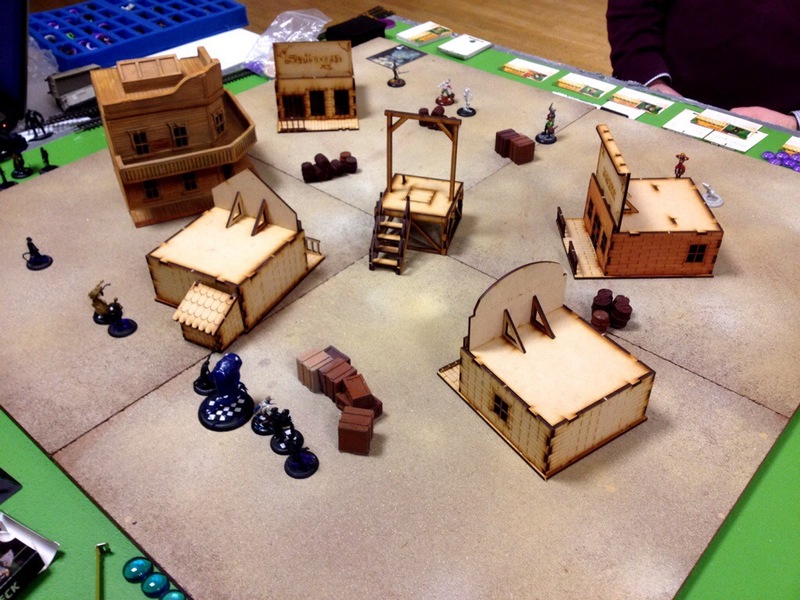 Had a first and much anticipated game of M2.0 this evening. It was a good game and has left me keen to play more. 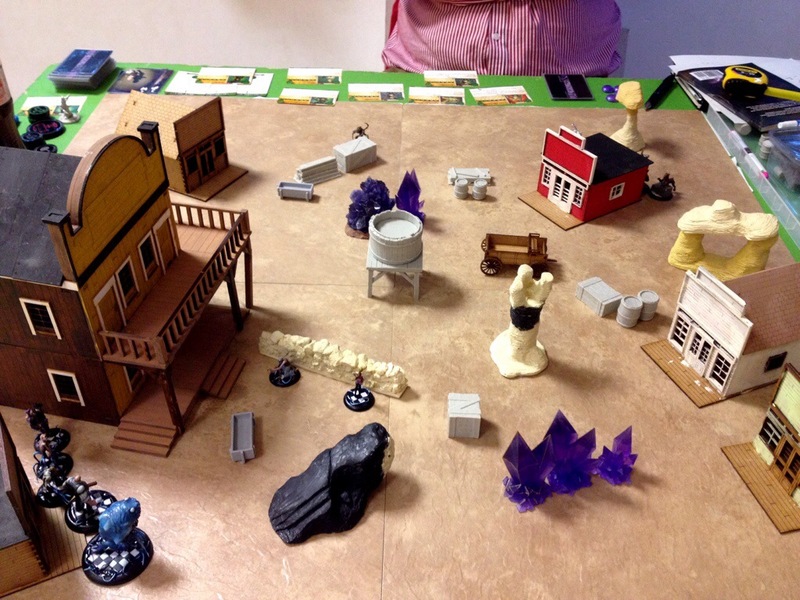 The game was 35 Soul Stones and a standard encounter on my newly created Wild West board. 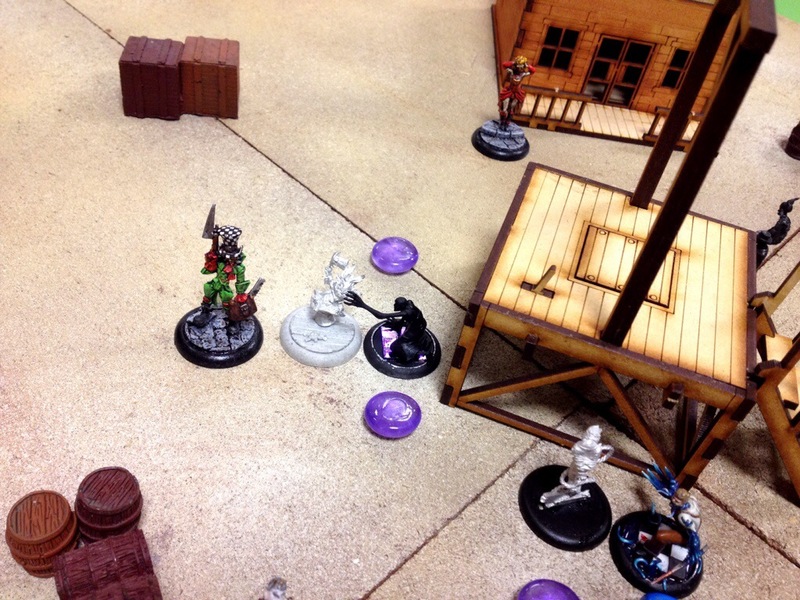 We drew standard deployment and various schemes of which I chose Assassination. This was purely to keep my objective as simple as possible while I got my head around the Jacob crew. I also rejected any upgrades and went for Jacob + Huggy, 2 x Illuminiated, 2 x Depleted, 1 Beckoner and Mr Tanen. 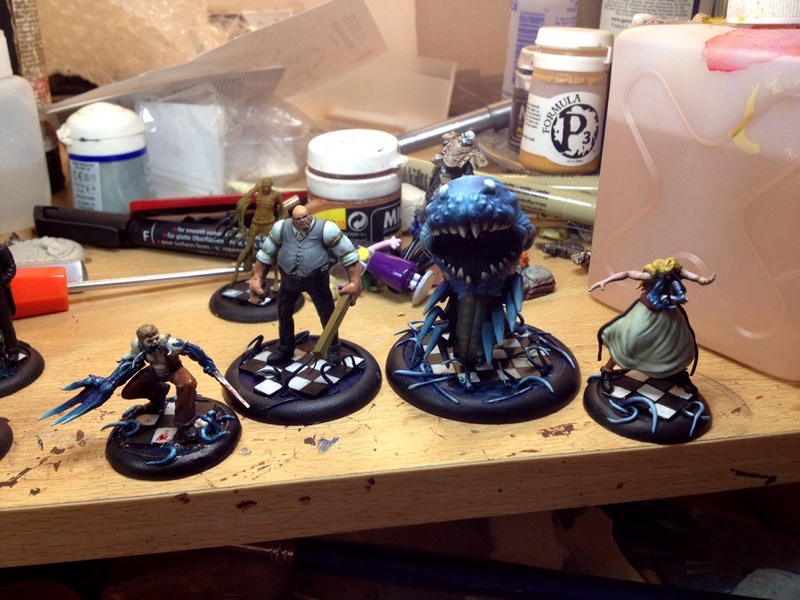 Across the board was Seamus with his crew of undead and the Copycat Killer. Not really knowing what to expect I went for a symmetrical deployment. Jacob was placed near cover as I planned to use him defensively while Huggy was central and I planned to just run him straight into the action. Seamus set up in the middle and came forward very aggressively in turn 1 to occupy a central position. 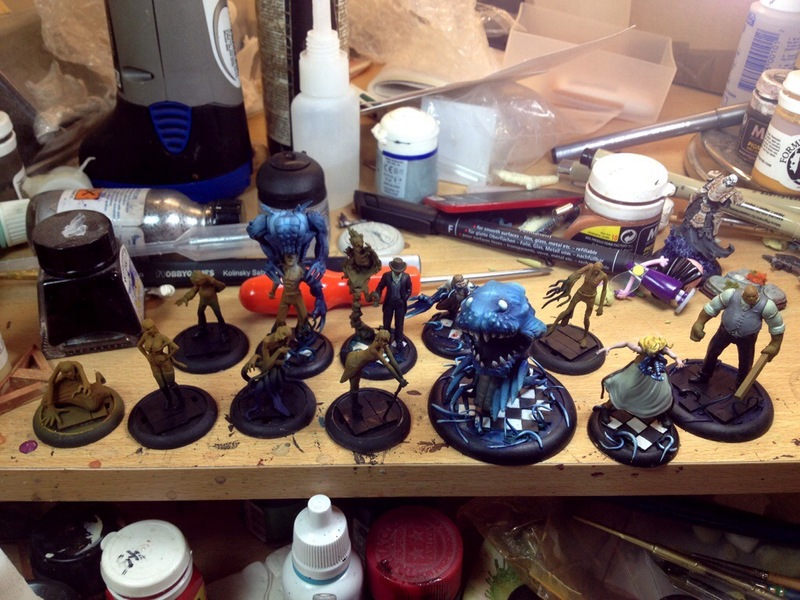 I moved all of my models forward but left Jacob behind his crates observing the action from a safe distance. Looking at the board at the start of turn 2 I was surprised to note several options for getting stuck into Seamus. An Illuminated had a pop and then took heavy damage back but then it was Huggies go. 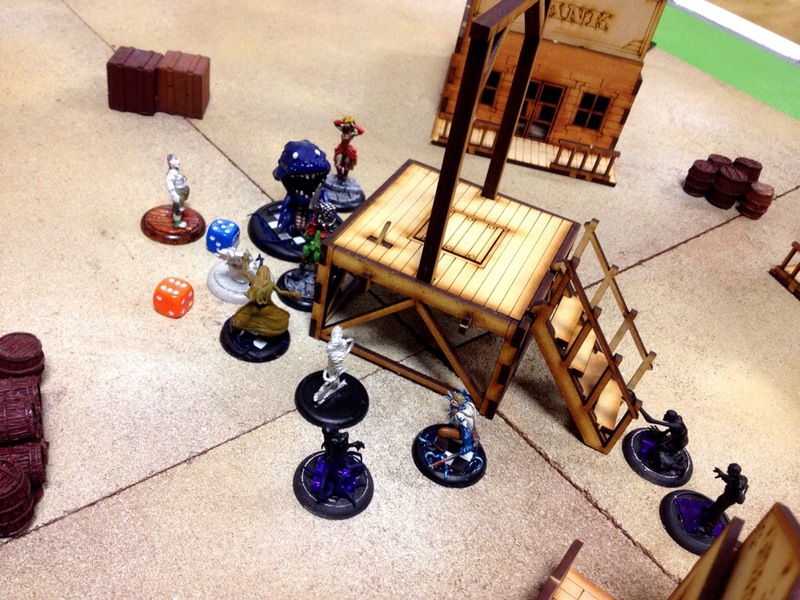 Using Incorporeal he charged through the gallows and a couple of models to Seamus. A couple of jammy draws saw him trigger Envelope on Seamus and I thought this might be curtains. However Seamus just managed to hang in there. As the turn continued it became apparent that I should be activating Jacob and Mr Tanen early to get the most from the buffs and debuffs they offer. Must remember this in future! Turn 2 closed out with a dangerous looking mosh pit in the centre of the board. Turn 3 was going to be the crunch. Jacob got the initiative flip and I had a dilemma : activate Jacob and/or Mr Tannen to get the buffs/debuffs off but risk Seamus escaping or taking down Huggy OR get Huggy’s retaliation in first and hope he could do it. I went for the latter and watched Huggy fluff his attacks and then go down to Seamus. This was not so good! At this point I was getting worried but Seamus only had a few wounds left. I decided to chip away at him with my remaining models. The Beckoner did a bit of damage and put Brilliance on Seamus. However, the killing blow came from an expected quarter. A Depleted was drawn to the Brilliance imparted on Seamus by the Beckoner. It crawled over the gallows, dropped down the other side and sacrificed itself. The resulting splurge of Brilliance was enough to take Seamus down. At his point we called it a night and a 3 – 0 win to Jacob. The game was fun, had the right level of complexity and plenty of dark humour. Good stuff! The Jacob crew is fun. I like Huggy and although powerful he is clearly not invincible. The Brilliance mechanic is interesting and there are lots on interesting combos to explore between the models in the crew. Overall it’s a big thumbs up for M2.0 and Jacob from me.